Tag Archive | "traffic light"
A new traffic light at 14 Mile and Myers Lake will soon be operational. Photo from Courtland Township Fire Department Facebook page. We reported back in February that the Michigan Department of Transportation would be installing a new traffic light at M-57 (14 Mile) and Myers Lake Avenue, and it has finally been installed. 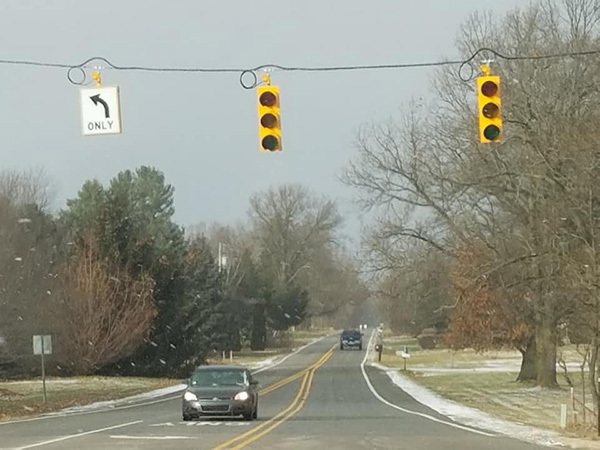 “The traffic signal study showed significant delays on Myers Lake Rd, high enough traffic volumes, and a lack of gaps in the M-57 traffic stream,” explained John Richard, with MDOT, as to why the light was needed. That’s music to the ears of people traveling Myers Lake Avenue that have a hard time crossing M-57. The traffic light should be operational soon.